posted by Thomas Tucker in sports, golf, news, batavia country club. 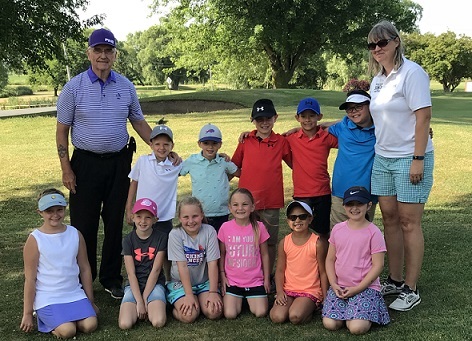 The Batavia Country Club recently completed three weeks of their junior golf camp. For Web page with pictures click here. Please note that next year we'll be changing the age groups to: Junior Division -- Ages 7-10; Senior Division -- Ages 11-15. There will be divisions for boys and girls in each age group. 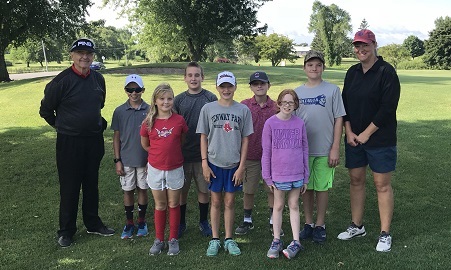 Pee Wee Division Boys and Girls -- July 9th-13th: Roane George, Naomi Utz, Riley Yunker, Maisse Yunker, Brooklyn Jachimowicz, Natalie Hamm, Josh Utz, Owen Glazier, Noah Calarco-Smith, Brayden Jachimowicz, Nicholas Calarco-Smith. The Pee Wee players experienced one day with a little rain, but overall it was a great week for golf! The Friday Tournament saw Owen Glazier dominate the boys' division; he medaled with a score of 29. The girls' division was a close contest, with Riley Yunker prevailing by two strokes over Roane George. This was Riley's second championship medal in two years! Closest to the pin winner on hole 13 was Roane George, and on hole 17 the winner was Brayden Jachimowicz. The long drive winner on hole 14 was Owen Glazier. Aim Line Accuracy -- Natalie Hamm; she won a few bucks for herself and her fellow golfers for the effort. The kids had fun, and we hope to see them all next year. Junior -- Senior Boys and Girls Division -- July 23rd-27th: Michala Falkner, Lily Davis, Lindsey Betters Connor Demoy, Ryan Muscarella, Logan Clark, Tyler Roth. 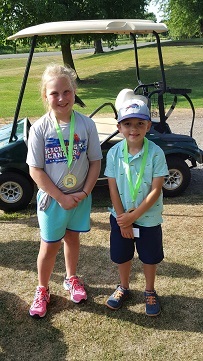 We had great weather all week for these kids, and they played very good golf. 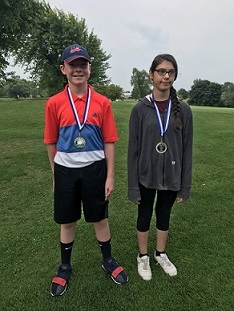 In Friday's Tournament, Ryan Muscarella dominated the other boys as he went low with a score of 34, and Lily Davis dominated her competition with a score of 48. Closest to the pin winner on hole 13 for the boys was Ryan Muscarella, and for the girls it was Lily Davis. Closest to the pin winner on hole 17 for the boys was Ryan Muscarella, and for the girls it was Lindsey Betters. The long drive winner for the girls on hole 14 was Michala Falkner, no boys hit the fairway. Aim Line Accuracy - Boys -- Tyler Roth, Tyler and Lily got into coach Tucker's wallet for a few bucks for themselves and their fellow golfers. Junior - Senior Boys and Girls Division, July 30th through Aug. 3rd: Molly Adkins, Kaylee Frens, Jada Fite, Amelia Frens, Emily Frens, Riley Prunner, Brennen Pederson, Rhys Tanner, Sam Dinsmore, Will Fulton, Andrew Ricupito, Even Preston, Coach Roxanne Noeth. We were concerned about the weather for this week of camp. Rain was projected for every day, but we got through the week without a drop! We had some high drama at the Friday Tournament. Will Fulton and Sam Dinsmore tied with a score of 39 and we had a playoff from 100 yards on hole 18. Both boys hit the green with fine shots, and Will Fulton prevailed with a birdie. In the girls' division, Amelia Frens shot a 44 to edge out Jada Fite by one stroke. Closest to the pin winner on hole 13 for the boys was Sam Dinsmore, and for the girls it was Riley Prunner. Closest to the pin winner on hole 17 for the boys was Brennen Pederson, and for the girls it was Emily Frens. The long drive for the boys was Sam Dinsmore, for the girls it was Jada Fite. posted by Maria Pericozzi in Maria's Sunshine and Dreams Fund, batavia country club, news. Children and their families dealing with cancer often need an extra ray of sunshine and that's the purpose of Maria’s Sunshine and Dreams fund, which is the focus of a golf tournament July 29 at the Batavia Country Club. There is still time to sign up for the sixth annual tournament, said Sarah Christ, Sunshine and Dreams Fund board member. Maria’s Sunshine and Dreams fund provides "sunshine" for children and their families facing medical hardships with large toys, family memberships to local zoos/museums, and needed "supplies" including gift cards for gas, groceries and more. The fund is made possible through donations and the annual golf tournament, which typically funds the program for the rest of the year. Registration for the golf tournament can be found on their website here and any questions can be directed to [email protected]. Maria’s Sunshine and Dreams fund was started in honor of Christ’s friend, Maria Nash Anderson, who lost her battle with cancer in March 2012 at age 25. Anderson served on missions trips while attending Roberts Wesleyan College, and worked as a youth caseworker for the Genesee County Department of Social Services. Christ said she loved children and wanted to make a better life for other children. Christ helps to personalize each gift by speaking with friends and family to find out the children’s interests and personalities. Missy Sacheli, mother of “Sunshine Kid” Joseph Sacheli, said the organization brings happiness, comfort and smiles to those who need it most and they will be forever grateful they were chosen to bring sunshine to. Almost all of the sunshine stays in Genesee County, but Christ said they do branch outward to surrounding areas to help other children. In the past, Maria’s Sunshine and Dreams fund has given a lot of the proceeds to Ronald McDonald House of Rochester to be used as a separate fund for families to have fun in Rochester while they were in the area and provide meals once a week. Christ said they realized they needed to keep the money local, so most of the funds go to local families now. “We want to try to help more kids in the area and spread the word around more than we have in the past years to get support in the community,” Christ said. Christ is hoping to continue growing the organization to give the children bigger and better toys, as well as help the parents provide more necessities. The organization started in Rochester but was brought back locally about four years ago. Since then, Christ said they have helped more than 20 children and their families, and the number is growing. Dawn Logsdon, mother of “Sunshine Kid” Roger “Bubba” Logsdon said it is a phenomenal organization that has a unique way to brighten kids’ days and put smiles on faces that have every reason not to smile. “The kids [Maria’s Sunshine and Dreams Fund] help have been dealt a terrible hand and [the] organization gives them the “wild card” that keeps them motivated to keep getting better and stronger,” Logsdon said. Sponsored Post: Join us for Mother's Day! Call Batavia Country Club for reservations! posted by Lisa Ace in Sponsored Post, advertisement, batavia country club, Mother's Day, Batavia NY..
posted by Lisa Ace in Sponsored Post, advertisement, batavia country club, Mother's Day, Batavia NY. posted by Howard B. Owens in batavia country club, batavia, Genesee Cancer Assistance, charity. Genesee Cancer Assistance held its annual golf outing today at the Batavia Country Club. Above, Andy Squire, of Spencerport, hits a shot off the first tee. Below, Debbie and Dan Fischer, of WBTA, flank Mary Blevins and Andrea Mazukiewicz, ESL Credit Union, while playing bocce ball. posted by Lisa Ace in Van Hulburt Memorial Golf Tournament, crossroads house, batavia country club, batavia, ny. 12:30pm Shotgun Start 4 person scramble, 18 holes with cart, lunch, dinner, prizes, $70.00. (Dinner guests only $20.00) Basket & Side Auctions also. Registration forms available at Crossroads or for more information call Marty @ 585­-494­-2147. posted by Jamie Lindsley in Oakfield Historical Society, batavia country club, Oakfield Museum and Research Center. George & Wilma Garrison Memorial Golf Tournament! posted by Lisa Ace in batavia, batavia country club, ny, George & Wilma Garrison Memorial Golf Tournament. George and Wilma Garrison Memorial Golf Tournament will be held on July 26th at Batavia Country Club with a 2pm shotgun start. For more information, call Mark at 716-474-7960 or Penny at 716-474-6581.
posted by Howard B. Owens in batavia country club, sports, golf, Dave McCarthy Memorial Golf Tournament. Today is the 7th annual Dave McCarthy Memorial Golf Tournament at Batavia Country Club. McCarthy was an avid athlete who died in a car accident in 2006. 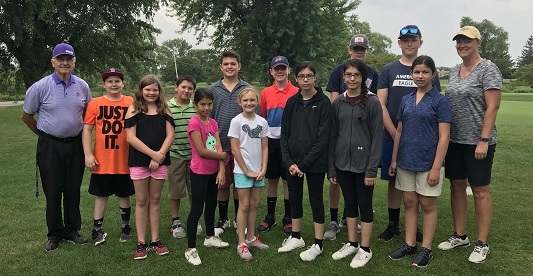 A field of 144 golfers along with 60 sponsors are raising funds to support athletics in Batavia, including hockey scholarships, Little League, and helping economically disadvantaged families get their children into hockey. Billy Sutherland, Dan Fix, Mike Sisson and Kevin Rogers. Paul Spiotta, kneeling, Brett Decker, James DeFreze and Jim DuRei. posted by Billie Owens in batavia country club, events. posted by Bill Schutt in Batavia Downs, batavia country club, golf, Mercy Flight.